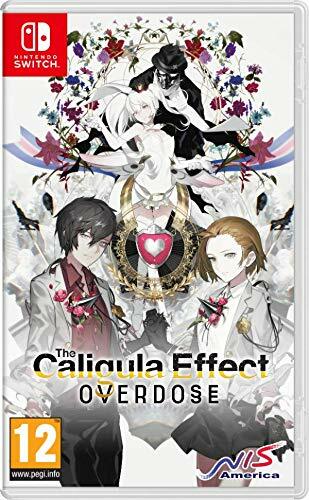 The Caligula Effect Overdose is a rerelease of a PlayStation Vita game from a few years ago. When the original Caligula Effect released, it was met with a lukewarm response from reviewers, prompting this more fleshed out and prettied up version of the game to seek a chance for redemption. The Overdose edition of the game expands the story a bit, offers new party members, and pretty HD textures for the jump to stronger systems. Caligula Effect Overdose follows the story of your nameless, voiceless protagonist and their rag-tag group of friends stuck in a virtual world, known as Mobius, created by an A.I pop star, as a sort of escape from the real world to an endless high school experience, where there are no issues and nobody ages. At some point, every person who made their way into Mobius left the real world in an escape of some sort of personal issue but lost their memories of the “real world” upon entry. The world of Mobius is filled with people who are blissfully unaware of the virtual world, and the others who are aware, will stop at nothing to maintain this world’s facade. Your character (boy or girl, based on your initial choice,) suddenly becomes aware of the virtual aspects of this world and collides into the only other students aware of its nature. This group is known as the Go-Home club, very subtle. The rest of the game follows your party as you take on the rogue A.I and her cohorts, the “musicians.” If you’ve noticed a pattern to the prevalence of songs in this game, that’s for a good reason. The AI and the musicians use music to essentially brainwash the other students of the world, keeping them complacent in its virtual state, or using them to fight against the non-believers. With a solid, and interesting premise, we begin to look forward into the gameplay. Moving through the world is done so in a dungeon crawler fashion, in a similar vein to the exploration of Persona games. The maps are in a generally maze-like structure, bringing you to dead-ends, branching paths, and filled to the brim with enemies. Littered throughout the map are different items that can be used to level up your characters or boost certain abilities. There however, isn’t much to explore here like landmarks or environmental options, generally just a sprawling maze to get you from point A to B. The environments are one of the best looking parts of the game and are rather varied. Offering locations such as the high school, sprawling city streets, an aquarium, arcades, etc. I’d love to see more interaction with the world or some sort of side quests that are more tied into the environment. The aesthetic of the dungeon only changes things visually, and nothing in the actual gameplay department. I’d have much preferred to see some notable differences in the dungeons to break up the monotony of wandering a maze that is fundamentally the same as the last. Other students roam the dungeons as well, but don’t interact with anything, they can be spoken to but don’t offer any interesting dialogue based on you current location. The hollow NPCs and bland interactivity make these gorgeous locations much less engaging than they could’ve been and is a major bummer. Personally, this makes the exploration one of the least interesting parts for me, and unfortunately is a huge part of the game, so it’s unavoidable. However, one aspect of the gameplay is extremely unique and fun, even with a few major flaws is the combat. A turn-based system in regular JRPG fashion but is one of the most experimental forms of turn-based I’ve ever seen. Turns are almost completely simultaneous, yours and the enemies. The beginning of your turn allows your party to make up to three actions per character, being a mixture of support, offense, and defense abilities. Before you issue an attack, a vision of the move is executed in front of you, allowing you to plan what to do next, who to use, what moves to use etc. This vision isn’t always accurate however and is based off the assumption that the attack lands, meaning it can be completely thrown off in execution. The option to allow all four party members issue attacks at once allows for some fantastic strategy. A standard turn could involve one member kicking an enemy into the air, and another teammate activating a move that is only used while an enemy is airborne, finishing with a member using an attack that is only effective when the enemy is down. Each member has a unique weapon with unique moves and properties ranging from downing moves, aerial moves ranged, evasive etc. No two members feel alike and is clearly where most of the thought went into. Unfortunately, this fantastic combat system isn’t without its flaws. Difficulty is rather subjective, but I feel in this case it is somewhat universal. On the “normal” difficulty that the game starts you on nearly every fight can be won with just mashing “A” and not using any strategy whatsoever. This of course can be mitigated by moving to higher difficulties, but it shows a major disconnect between the ambition of the combat system and the balancing of the said system. Raising the difficulty just increases enemy health and damage and not necessarily their ability to strategize. Due to the enemy placement, most matches will be your four members vs. one enemy. I’d have much rather preferred fighting many enemies at once that are capable of similar strategies rather than one short mediocre fight, over and over . Instead, most fights consist of an enemy squad who seemingly performs random attacks with little to no strategy, easily being blown out of the water by your own. Another underdeveloped aspect is the social system. On the positive side, social scenes will become available with your main party and offer great insights on their personalities, character development and their insecurities that brought them to Mobius. This is where the writing and characters truly shine and are genuinely enjoyable, giving you a genuine reason to care about your party members. The social system doesn’t end there as every single NPC in the game has one too. That’s right, all 525 of the random students walking around have a social quest to advance through. If you’re a fan of social aspects in games like me, this might excite you but don’t get your hopes up yet. Developing the social meter with the NPCs is as simple as talking to them 3 times, becoming their friend and solving whatever issue it is that brought them to Mobius like their weight, relationships, fears etc. Your character has the ability to solve these issues by gaining insight into certain problems when exploring or defeating enemies. As neat as an idea it is, it ends up being incredibly monotonous and underwhelming. It becomes apparent very quickly how many of these characters are copy-pasted versions of one another, with a variety of about 4 different character models and similar boring dialogue, no student feels genuinely real. Luckily, this mechanic is completely avoidable but I would’ve much appreciated seeing that number cut way down while expanding the dialogue options and models to make them feel unique. Quantity was chosen over quality here, and it shows. Presentation is the final mixed bag of the game. On one hand, the drawn character portraits are gorgeous and expressive but the quality is not matched in-game. No 3D model in the game has a moving mouth or even expressions, all just flashing the same half-baked smile as they speak. If that sounds uncomfortable, it is. Luckily, you can ignore it and just watch the portraits during dialogue but seeing straight faces and eerie smiles during intense combat situations breaks the immersion hard. The animations are extremely bare-bones as well. Characters moves are stiff being either too slow or too quick. It’s clear that the budget was focused on the story and combat aspects but the visuals take a major drop in quality as a result. Overall, The Caligula Effect Overdose is one of the most conflicted reviews I’ve ever had to give. The ideas here are fantastic but never become more than ideas. The music and environments are enticing but dragged down by stiff characters and boring NPCs. If you are a fan of Persona and need something to fill the hole, this might be it, but don’t come into the game expecting an extremely high-quality experience. The Caligula Effect Overdose offers a great story, well-written party members, and a unique combat system. Most of these aspects aren’t expressed to their fullest capacity and end up being underwhelming and repetitive. There’s a lot to love here but is equally matched by the unloveable portions.